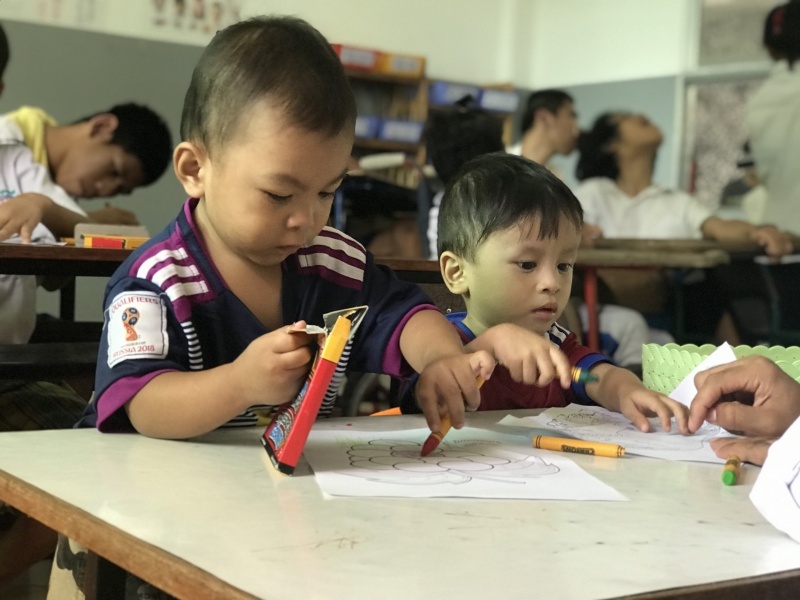 A large, cream-colored building about 30 minutes outside of the downtown area of Phnom Penh is the home of 140 Cambodian children. 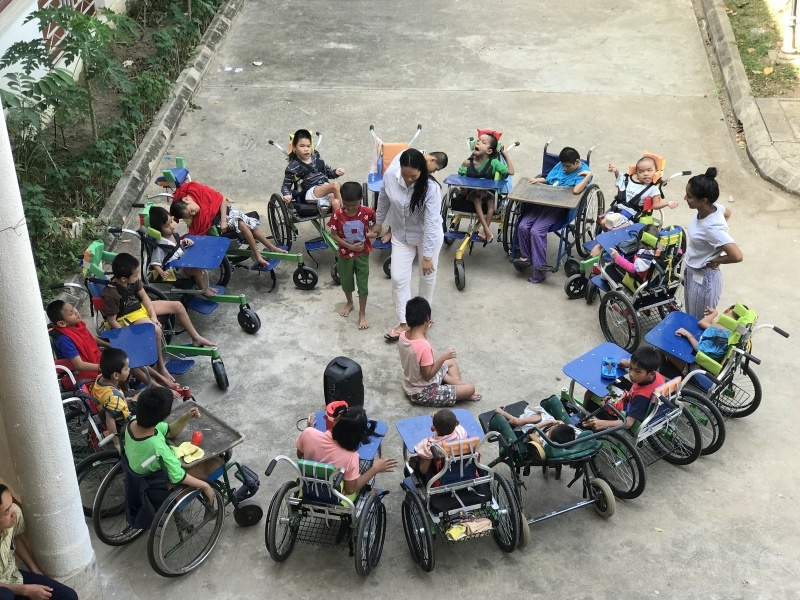 It’s an orphanage, but most of these children are mentally or physically disabled, and about 15 of them are infected with HIV. The ages of the children range from 3 months old to 38 years. The one thing they all have in common is that they have been abandoned by their parents at a young age. Most were left at the hospital, right after birth. Their parents may have feared the medical costs to care for them, or simply weren’t prepared for the level of responsibility. There is a large yard in front of the u-shaped building with swingsets and picnic tables where the children can play outside. 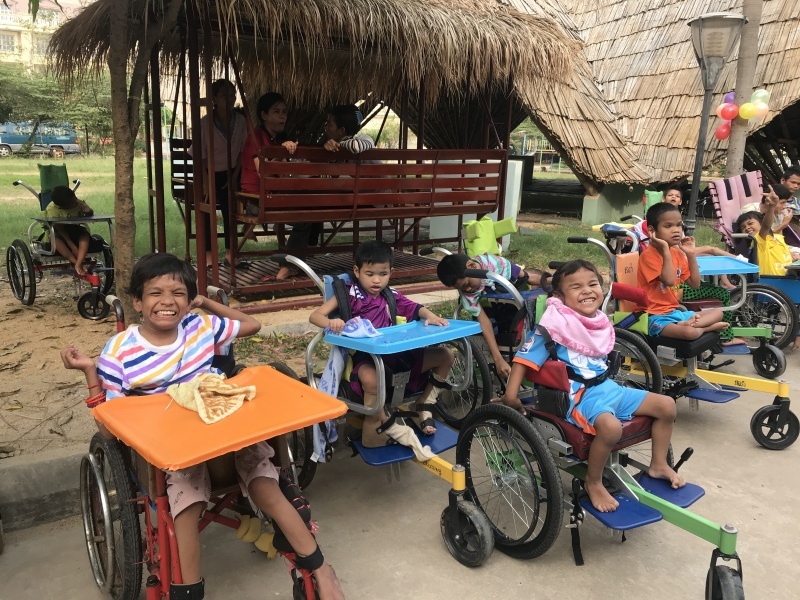 As you enter the building, you’ll see children laying on mats, being entertained by “mommas” or sitting in their wheelchairs, watching the activities around them. The “mommas” are the women (and occasionally a few men) who are employed by the government, at a very modest wage, to be the caretakers of the children. There are also several “mommas” that come from other countries to volunteer. As you wander through the building you’ll notice that it resembles a rundown hospital. But it’s been spruced up with some colorful murals on the walls and photos of the children that live there with huge smiles on their faces. 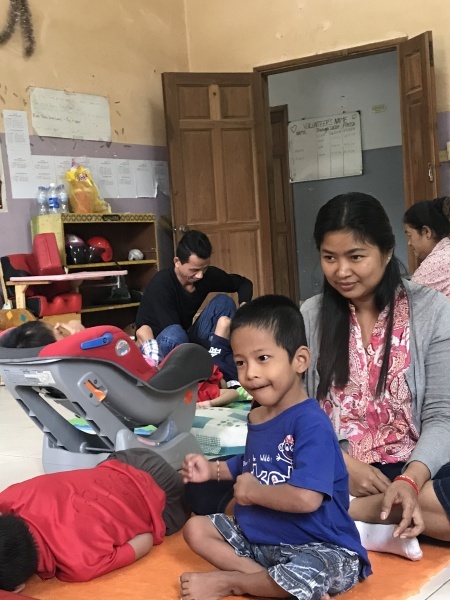 Children have been broken up into small groups with a handful of mommas who are entertaining them, changing their diapers, helping them to sit up, and generally looking after their well-being. In one room you’ll see mommas helping the kids with physiotherapy exercises – stretching their legs and arms. Move to the next room and you’ll see children playing – they’ve been grouped together by their comprehension ability. A sensory room has bright flashing lights and different scents and textures which the children get to experience on their own (with a momma helping out of course). You can see the rooms where the children sleep. They have simple mattresses, some on the floor, some in a crib, some on a box spring of sorts. 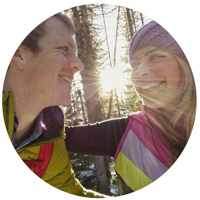 They don’t have personal belongings as this is the only family they have known since birth. The pictures of the children are with these mommas – the kind, caring women who dedicate their lives to care for the children who were abandoned. The accommodations here are basic, the food is simple, but the love and adoration for the children is remarkable. The mommas put their whole hearts into being the closest thing to a family that these kids will ever have. The facility where these children live is run by the government. They receive a very small amount of funding to feed and care for the children. It works out to only about $1.50 per child per day. And the mommas are also paid a small wage to work in the facility – either $150 per month or $250 per month depending on their title (even though everyone here plays a similar role). These children require 24 hour care, 7 days a week. And most of them will never be able to live on their own without a caretaker. They will live the rest of their lives in this facility, or one like it, under the care of these trusted mommas. Several nonprofit organizations provide assistance here as the government funding and programs are not enough for these children. One of those is the BraveHearts Program. The BraveHearts Program is one of the organizations that works with these orphaned children. Through donations and fundraisers they provide additional capital to help pay the mommas a livable wage and to provide the children with necessary food, medical supplies, wheelchairs, and toys. 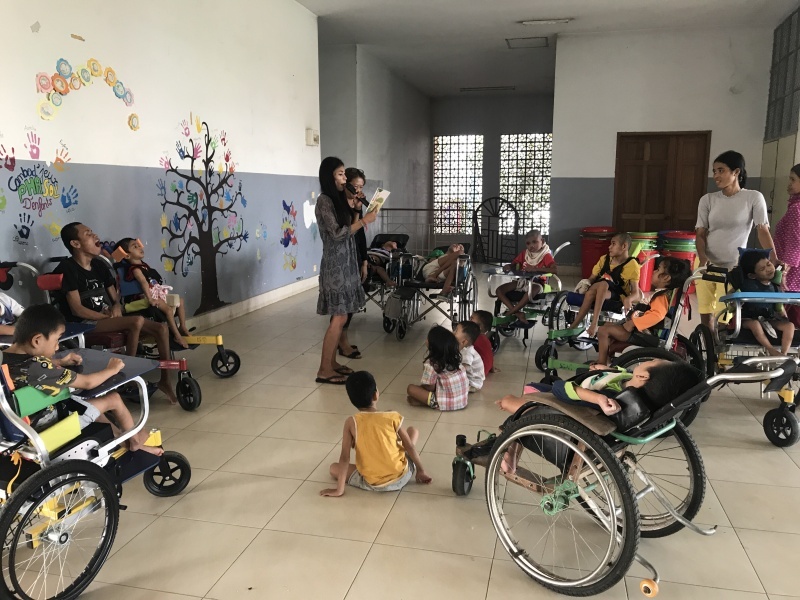 They also help to provide the children with the medical care that they require through an onsite doctor, several specialized therapists, and ongoing training for the staff. And they take the kids out for special outings and organize celebrations filled with love, laughter, and full bellies. Ideally, the children in this facility would receive one on one care. One momma for each disabled child. But unfortunately, due to their lack of resources, it’s closer to 1 momma per 10 disabled children. So they rely on volunteers from around the globe to help. You don’t have to have any specialized skills to volunteer with BraveHearts, only a big heart and lots of love. Of course it’s a big bonus if you have any experience in physical therapy, childhood development, or experience working with people with disabilities. BraveHearts asks that you commit to volunteering for at least a month but they can be flexible if you don’t have that much time to give. You’ll need to submit your resume and pass a background check. Learn more about volunteering with BraveHearts here! You can also contact Srey Peuv, the program administrator at admin@braveheartsprog.org. As we mentioned, the orphanage is partially funded by the government of Cambodia, but only for about $1.50 per child per day. Anyone who has ever cared for a child knows that is only a fraction of what it actually costs to feed, clothe, bathe, and entertain one. And more children are coming to the orphanage all the time. They expect 20 new children in the month of March alone. 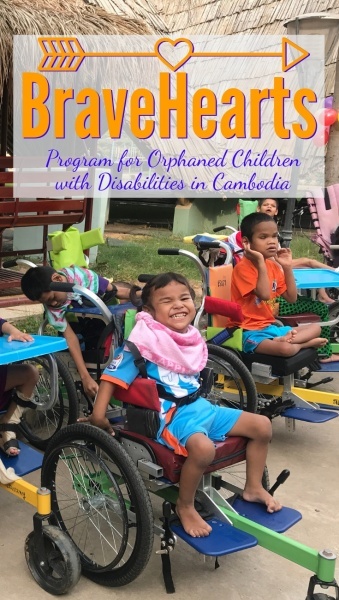 If you have the ability to donate to the BraveHearts Program, no matter how small, it will help them to pay for nutritious food, medical equipment, wheelchairs, clothing, diapers, medicine, vaccinations, hygiene supplies, and toys and learning materials for the children. It also helps to support the mommas who devote their lives to these precious little ones. Please visit the Donation Page of the BraveHearts website to learn more about how you can help! Thank you for reading about this opportunity to give back to the children of Cambodia!